In today’s door of the Advent Calendar we will explore a game form that I recently started using quite frequently in my training sessions. The above game is all about exploring diagonal play, especially diagonal 3rd man combinations. But first and foremost, it is important to understand why diagonal passing and actions are so important and worthwhile to strive for in a positional context. If we look at a plain forward pass, without taking the opposition into account, it has the advantage of spatial gain (getting closer to the opposition goal). Whilst the main disadvantage thereof (in grossest possible terms) is the fact that the receiving player has a closed field of vision (facing his own goal), therefore when receiving the ball, this player has to turn before being able to go towards the opposition goal. In modern football these forward passes are often pressed heavily by forward defending blind-side defenders who use these passes as a trigger to try and win the ball. Horizontal passes are quite the opposite, whilst the receiver has an open field of vision (facing forward towards the opposition goal) no spatial gain is made with this type of pass. Whilst both horizontal and vertical passes carry crucial importance in any game of football, and should never be discarded in any way, diagonal passes, and especially diagonal forward passes summarize the strengths of both the above. You receive the ball closer to the opposition goal than the passer who played the ball whilst also enjoying an open field of vision. Therefore, these passes should be actively promoted within training games and the value thereof should be made clear to the players, implicitly (through field dimensions and game rules) and explicitly (through the coaches’ explanations). Another advantage of diagonal passes and actions is the fact that it creates problems for the opposition in terms of who should close the ball down, as within the defensive shape horizontal and vertical lines are broken simultaneously with one passing action. To promote all of the above, we shape the field into a diamond, as shown on the graphic above. This means that the field gets narrower as you get closer to goal in either playing direction. Therefore, wide play in the attacking third is not worked on in this game, while central and diagonal attacks towards goal are enforced by the shape of the field. This is a common form used within the Red Bull football development structures and is in itself nothing uncommon for many coaches. To specify the game to our playing style we divide the field into 3 vertical channels. There are a number of offensive reasons for this: Firstly, we want to make the players aware of the idea of playing out wide, to bypass pressure in the buildup, but instead of continuing the attack with long-line passes and crosses, we want to very quickly find a route back into the center. Using the wide channels as a detour if the center is compact initially. Secondly, we want to condition the wide players to actively scan diagonally towards the ball-near center/half-space before receiving the ball. This should create a clear orientation point for these players towards the playing principle mentioned in point #1. The advantage thereof is that not only do you progress the ball into the attacking center quite success-stably (use of less crowded areas of the field/have a large variation of directions to progress the ball) but with this you also create a larger degree of problems for the defensive team to solve. The first pass into the wide area is inevitably diagonal (due to field shape), this is most likely followed by the opposition shifting towards the ball as a unit to get goal-side and compact around the player receiving there. If this is answered by the wide receiving player playing a quick 1 or 2 touch-pass diagonally or even horizontally into the middle zone the pass will be played against the grain of the defensive shift with 2 quick changes of ball-direction happening within a short period of time, potentially freeing up players facing forward in the center of the field, who can then play dangerous forward passes or play other combinations. How do we achieve these combinations? As mentioned above, the field dimensions already encourage diagonal play, but we add some rules to get the combinations we require. Firstly, as in the tube game, a normal goal counts for 3 points. This is to create a goal focus despite the coaching (implicit and explicit) being focused on combination play. The second rule is that if you play wide and the receiving player in this zone plays a 1-touch 3rd man pass back into the middle, that equals to one point. This is similar to the third man rule that we use in the tube, however more specific to a certain type of combination without making it too set. What this rule also does is to keep a central focus despite using wide zones in the point scoring system. With the second (3rd man) pass having to go back into the center, it doesn’t make much sense for the possessing team to have too many players in the wide area (also due to the field shape). Another way to vary the point scoring would be to use the following point scoring system: Goal scored 3 points, normal 1-touch 3rd man combination 1 point, the above mentioned outside-inside 3rd man combination 2 points. Another playing-principle that should be actively coached during formative junior years is for players to actively scan for the furthest possible flat forward pass. Again, this creates a further reference for players scanning-actions (a point that I made in my previous article) that continuously coaching this, speeds up play and team-coordination even more to make combination play and ball-progression success stable. This principle can be coached within this exercise by creating the following point scoring system. Goal-scoring 3 points, outside-middle 3rd man combination 1 point, outside then flat pass to ball far middle (with the middle further divided into 2 parts) 2 points. This incentivizes the players to create the behavior wished for by the coach without forcing them to do it in any rigid fashion which would restrict their creativity or make the game predictable and less success stable. Therefore, the above combinations are never enforced by the coach but merely encouraged. If the players don’t use these combinations, then the game continues as per normal without having scored points. For me it is also very important that players are free to move into any zone at any point of time in the game, as they would be in the game. However certain advantageous structures will be encouraged explicitly by the coach and implicitly by the field dimensions, creating a flowing and harmonious game close enough to the real game to have a good transfer of playing behavior. With these 3 vertical zones, it is also very easy to create a defensive focus, by either scrapping some of the above attacking rules or by adding defensive rules. 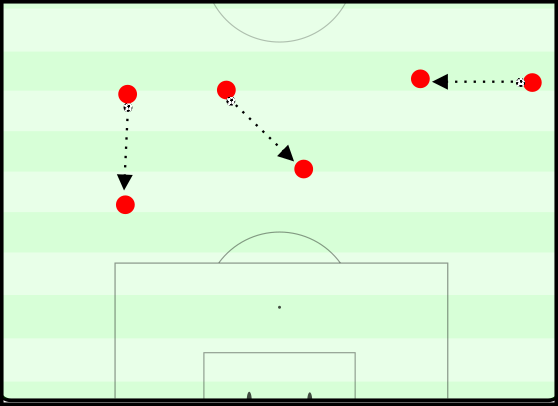 For vertical compactness, particularly when the ball is on the wing, the defensive team could be forced (by rule) or encouraged (by merely giving them an orientation point) to have all outfield players within 2 zones of where the ball is, leaving open the far-side of the field and perhaps also working on winning the ball by the wing, implicitly encouraging diagonal sprints towards the ball in wide areas to win the ball (field shape). There are doubtlessly many other variations to be created specific to a team’s stage of development and/or game model the coach wants to create. My team took to this game form like a duck to water. Played in a 7v7 or 8v8, they enjoyed it massively and played some beautiful and creative combinations within this, and example in the above drawing, again involving the 3rd man. We usually play this game either as a tournament form with 3 teams, each playing each other twice in 3 or 4-minute games making up a total of 6×3 minutes with each team playing 4×3 minutes thereof. Within the context of a session, this game can be used as an end or main part, depending on session focus and day used within a training week. I used this game with strong level U15 and U16 players. With younger/weaker players, it might be advisable to start with less rules and gradually add them in. Counting points can be quite challenging for the coach and an assistant coach can be an excellent help here. Nevertheless, once again I believe that you get quite used to doing it after a while and also get yourself to focus on certain combinations and positions on the field as a result of counting the points. My explicit coaching points included: layers in possession, scanning towards the center, creating diagonal passing options, scanning towards the 3rd man, diagonal 3rd man combinations followed by layoffs and deep runs as well as looking for the furthest possible flat forward pass and open body positions (explaining the importance thereof within the context of the game form). Good luck with the form and enjoy the adaptation process!